In 1970, computers were either room-sized mainframes or refrigerator-sized mini-computers. They were used by colleges and banks and required stacks of punch cards to do their number-crunching. Between 1950 and 1973, there were a few attempts to market smaller computers and do-it-yourself kits. They ranged from simple machines that could play a few games to larger machines that were certainly smaller than a traditional computer but still much too large and expensive to truly be called personal computers. 1971: The Intel microprocessor was invented, paving the way for hand-held calculators and personal computers (PCs). 1974-1976: The first successful PCs were do-it-yourself kits: the Mark-8 in 1974, the MITS Altair 8800 and Sphere 1 in 1975, and the Apple I in 1976. 1975: The Microsoft Company was formed to write operating systems and software programs for these new machines. 1976: The first word-processing program for PCs became available: Electric Pencil. 1977: Three pre-assembled models were introduced....the Apple II, the Tandy Radio Shack TRS-80 and the Commodore PET. 1978: Data was stored on cumbersome, unreliable tape cassettes. In 1978, Apple began using the floppy disk drive, and the other PC manufacturers began to follow suit. 1978-1979: More PC models were released, including the Atari 400 Home Computer and the Apple II+. 1978-1979: Modems and phone lines were used to create the first computer network in 1969. During the 1970s, many small computer networks were formed by universities and government agencies. During 1978 and 1979, this technology resulted in the first bulletin board systems and online services for PC users (see "Computer Networks" below). 1979: The general public began to realize that PCs were more than just toys for geeks when they saw what programs like VisiCalc (spreadsheets) and WordStar (word processing) could do. The scene was set for the PC explosion of the 1980s. Videotape was first used in the television industry in 1956. The first home video recording systems were introduced in 1963. These machines were very large and expensive, and required the services of an engineer to set them up. The first portable units were introduced in 1968. These reel-to-reel machines were called VTRs (Video Tape Recorders). The first machines to use videocassettes were introduced in 1971. Between 1971 and 1973, a variety of videocassette players and recorders were put on the market, but none of them lasted very long. They included the RCA Selectavision, Sony U-Matic, Ampex Instavision, AVCO Cartrivision and Phillips Video Recorder. Many models were sold with optional video cameras. In 1975, Sony introduced the Betamax videocassette recorder (VCR), and JVC followed it a year later with the VHS model. At this point, VCRs were still sometimes referred to as VTRs, a holdover from the old reel-to-reel days. At first, high prices prevented most people from owning a VCR, but business picked up when prices began to fall in the mid 1980s. A new line of video cameras was introduced to go along with the new VCRs. They were very bulky and cumbersome, and could only be used with a portable VCR slung over the shoulder. 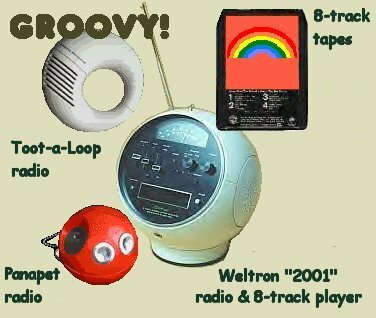 In the 1970s, the transistor radios of the previous decade evolved into brightly-colored novelty radios. In the 1950s, the first cassette tapes were used in office dictation machines. In the 1960s, 8-track tapes and cassette tape recorders were introduced for home music and recording use. In the early 1970s, sales of cassette players increased when new technology improved their audio quality considerably. When their use became common in the 1970s, the old reel-to-reel tape recorders of the past were rendered obsolete. Quadraphonic sound simulated the "surround sound" experience by using four audio channels instead of two. The technology was introduced in 1969 and came into wider usage in 1973. The first album recorded in quadraphonic sound to reach $1 million in sales was the Elvis, Aloha From Hawaii live recording. By the late 1970s, the high cost of equipment and the confusion over competing formats ended the quadraphonic boom. LED (light-emitting diode) and LCD (liquid crystal display) screens were introduced in the early 1970s and were quickly put to use in watches, clocks and calculators. Desktop calculators could be found in every office, and the invention of the microprocessor in 1971 put a mini-calculator in every pocket. 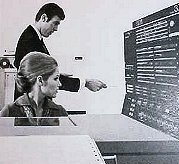 In the 1960s, computers became a necessity for any business needing to perform data processing on a large scale. In the 1970s, they became a part of our everyday lives. More businesses were turning to computers to handle their calculating and data processing needs. Airlines handled reservations, banks processed checks and college students registered for classes by computer. Utility companies and department stores used them for customer billing. By the late 1970s, many high schools were using them to plan student schedules and print out report cards. Computers also helped launch a new fad for young single people: computer dating. In most businesses, one mainframe provided centralized computing for the many remote terminals that were linked to it. This was known as time-sharing. Although some computer terminals used video display screens, most terminals used a teletype machine for input and output. Commands were typed on the keyboard, and the responses and prompts were printed out on paper. 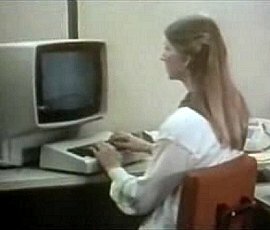 In the 1970s, the advent of word processors and smaller, faster computers made the big terminals and slow teletype machines seem very antiquated. This resulted in the introduction of the computer monitor in the early 1970s. At first, monitors were known as glass teletypes. In the photo at right, the computer operator is using a teletype machine. Data and programs were stored on reels of magnetic tape and floppy disks, which were introduced in 1971. Input was entered from a keyboard or fed on punch cards. Because the teletype terminal was very slow, programs were often prepared ahead of time on punch cards. Each card held one programming statement, and the one thing you did NOT want to do was drop your stack of cards! Personal computers (PCs) were introduced in the mid 1970s, but most businesses didn't really take them seriously. They weren't adopted for office use until the late 1980s. In 1962, ARPA (Advanced Research Projects Agency) began developing the ARPANET, which used phone lines and packet switching to link entire computers to each other. There were four nodes on this network, and each node could accomodate several computers. The first official transmission via the ARPANET occurred in 1969. In the beginning, nodes were added to the ARPANET at the rate of about ten per year. By 1973, there were 30 nodes, including Xerox PARC, NASA, the Air Force and the University of London. Electronic mail was developed in 1971, and by 1973 it comprised 75 percent of all ARPANET traffic. In 1975, the ARPANET had 61 nodes. In 1973, two new computer networks were introduced: PRNET (packet radio) and SATNET (satellite). In 1974, TELENET was the first commercial network service that any business or college could subscribe to. Some universities and government agencies also formed their own networks in the mid 1970s. Scientists hoped to eventually link these networks together, but for the time being, they operated independently of each other. In 1976, dial-up connections were developed. This gave database and network access to anyone with a computer, phone and modem. The large computers that were connected by nodes became hosts and the legions of dial-up computers became users. In 1978 and 1979, the new dial-up technology made bulletin board systems and online services possible. These were the first online systems for computer hobbyists. The first bulletin board system (BBS) was created in Chicago in 1978. This dial-up message board was operated by a college student from his personal computer. PC users could dial in, post messages and read messages from other users. In 1979, Compuserve and The Source gave PC owners their own networks in the form of online services that provided e-mail, games and forums on a subscription basis. The first successful link between networks was achieved in 1977....PRNET to ARPANET to SATNET to London and back again. The internet that we know and love was on its way! The typical 1970s office contained lots of earth tones....gold carpeting, brown paneling and beige metal desks. There were modern abstract paintings on the wall (also in earth tones) and maybe some plants. Usually, the desks were lined up in rows, with no dividers between them. The concept of individual cubicles hadn't really caught on yet. The concept of the smoke free office was still years away. Workers smoked in the office....heck, they even smoked at their desks. Letters and documents were typed on electric typewriters. The IBM Selectric was the most popular model of the 1970s. Carbon paper was used to make multiple copies. If you made a mistake, you inserted a piece of typewriter correction tape into the machine, re-typed the wrong letter to erase it, and then typed the correct letter over it. Dictation was done the traditional way, with a dictation machine or by a stenographer using shorthand. By the 1970s, the old recording formats (embossed belts and plastic discs) had been replaced by modern dictation machines using small cassette tapes. In the mid 1960s, the first word processors were called text-editing typewriters, and were nothing more than typewriters with magnetic tape memory units. By 1973, there were over 100,000 of these machines being used in American offices, and they were now known as text processors. Wang Laboratories introduced the first computerized text processor in 1976. Many of these units continued to resemble typewriters, while some used floppy disks and a small monitor for on-screen text editing. Text processors bridged the gap between large computer systems and the personal computers that came later. Many offices had a Telex machine. Also called a teleprinter or teletype machine, it used telephone and telegraph lines to send text messages to other offices, where they were printed out by the Telex at the receiving end. Business cards listed both a phone number and a Telex number. The desk telephone had buttons across the bottom that lit up when a call came in. To take a call or dial an outside line, you simply pushed the appropriate button. It was all so easy....no voice mail, no call forwarding, no accidental disconnections and no complicated instruction booklets. The use of telephone answering machines began to catch on during the 1970s. Although they were gradually coming down in price, they were still quite expensive. A top-of-the-line model could cost nearly $900. If a business needed absolute privacy or couldn't afford a receptionist, the high cost was worth it. Most companies needing around-the-clock phone monitoring used an answering service, where employees answered calls and took messages 24 hours a day. *In 1970, four million people in the U.S. were unemployed. *In the 1970s, the rate of unemployment ranged from 3.9 percent at the beginning of the decade to 9 percent in 1975, when inflation and the energy crisis took its toll on the economy. The decade finished at 6 percent unemployment. *The average yearly salary in the 1970s was $7,564. *In 1970, 40 percent of mothers worked outside the home. *In 1975, the U.S. work force was 61 percent male and 39 percent female. Although administrative and management jobs for men were becoming more common, the majority of American men still worked in blue-collar fields. Women's jobs were becoming less domestic (maids and nannies) and more clerical (bookkeepers and typists), but women were still rarely in positions of leadership or decision-making. Job dissatisfaction in the 1970s was higher than ever before, and this resulted in reduced production, high job turnover, increased absenteeism and frequent labor strikes. Several new strategies were introduced to reverse this trend, most of which have become common in today's workplace.